Home by Ally: How I clean - Have a clean house in 7 days! HI! 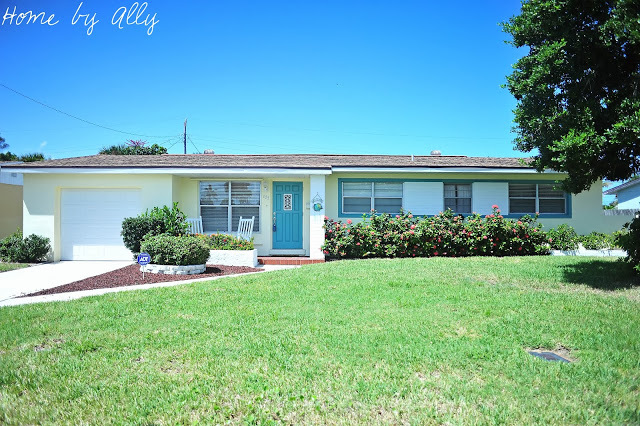 Welcome to Home by Ally! 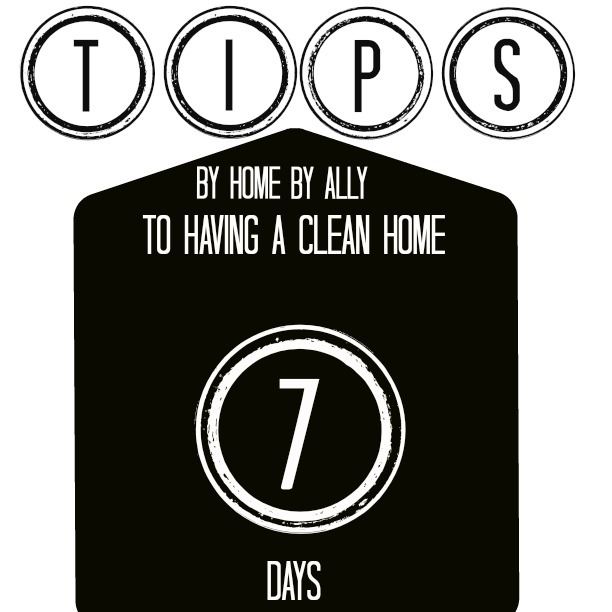 Today we're talking about how to keep a clean house in 7 days! Do you struggle to keep your house clean? Maybe because of pets? Or kids? Or both? Or a husband that is a second, third or fourth child? 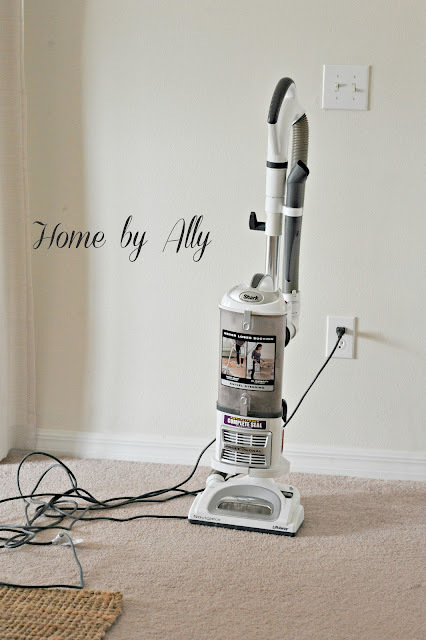 I'm Ally from Home by Ally and I've decided to share my tips on cleaning and how I clean OUR home...in high hopes that it will help each one of you! 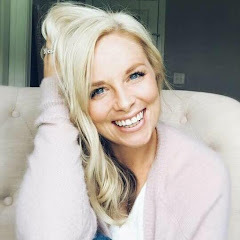 As we all know, there are many different ways that people clean, a lot of which you can find on Pinterest so I just decided to make my own list! Follow along with me in the post to a clean house in just 7 days! I will break down all that I do in order that I do the cleaning. I do not pick certain "days" of the week to clean certain rooms or clean certain items. So here goes! Be sure to remember that you can customize this to what fits your life and family the best! And also remember as my mama has always said "Rome was not built in a day." Your home will not sparkle, shine and be model ready in a day. It takes time and work everyday! Do as much of these as you can each day and you'll be surprised how much you get done! You can also print this out and check off each as you do it! First thing is first... open your windows. If you have your air on, open your blinds. If your air is off, open those bad boys up. 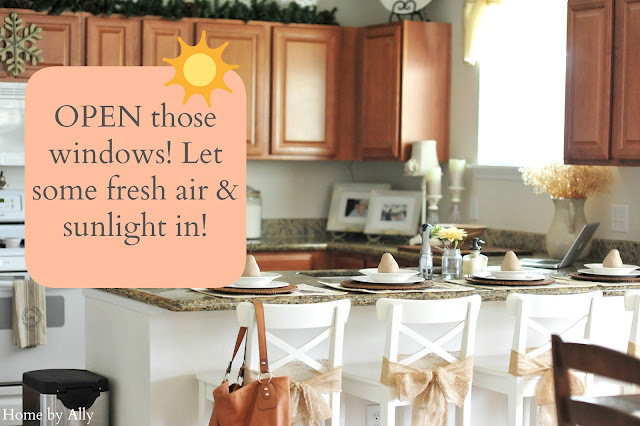 Turn all of fans on for circulation and let the sun in! It is proven fact from the vitamins in the sun that it is good for us and can in an instant, make you feel better! 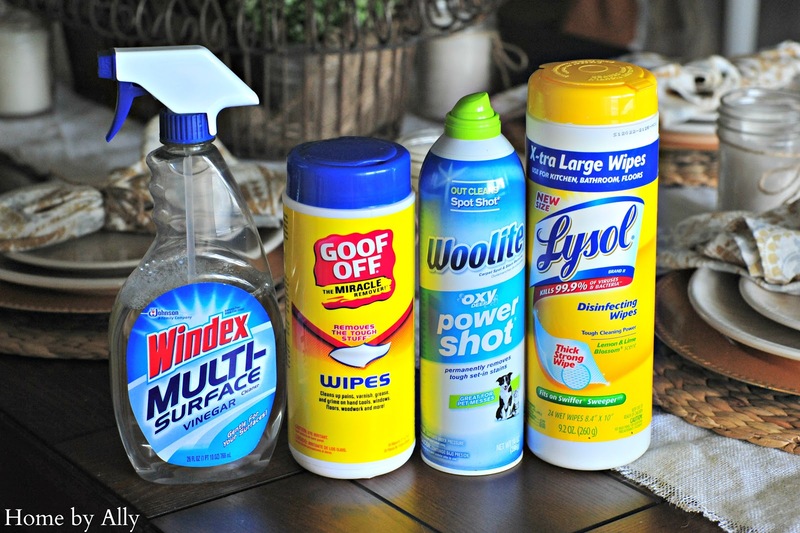 Here are the four cleaning products that I use THE most around my home. Windex MultiSurface- I cannot rave about this product enough. I buy at least three of these every time we go grocery shopping! This is definitely my go to cleaner for windows, countertops, doors, you name it, I use it on it! Goof Off Wipes- Be warned that GoofOff is VERY strong and will easily take off paint but also can eat up a finish, etc. I only use this if I have a nasty stain on the counters or if I accidentally get paint on something. It happens around here y'all, a lot. Woolite- Oxy Powershot- We have dogs. Furbabies. Our children for now. And they sometimes like to test mommy on rainy days by charging into our house from going potty and get those muddy paw prints all over mommy's nice and clean carpet. This is a LIFE saver. And a little goes along way. Every stain I've ever gotten on my carpets, it has gotten out. Muddy paws. Spaghetti, you name it. Lysol Wipes - I use this when I am wiping down things such as doors, handles, refrigerator, freezer, sink & anything else where there is constant contact of germs. LOVE IT. I am not being paid to support any of these products. These opinions are all my own. These are my recommendations for cleanings. These all do NOT have to be done in one day. I recommend printing this list off and doing at least 3-5 of these a day if applicable. Wake up. Get ready to start this process! It will be fun! At least I think that cleaning is fun...haha! It's the end result people, it WILL be worth it! OK! Drag yourself out of bed. And bring those sheets with you. Be sure to get the guest bedrooms & all of the kids too. Don't forget the pillowcases as well. Put them in the washer and start them up. Yawn. No need for pretty makeup or fixing your hair. Just throw it up, put on some old clothes and let's get to work. Do you have a favorite playlist? Put it on and DON'T turn the TV on unless the kiddos are watching cartoons or something :) If you have kids and can't just jump out of bed and do this, try starting at nap time... or when you have a free moment, do it. If you find that you have a lot of laundry, try putting a load in every time you are near the laundry room or right whenever you hear it go off. Be sure when your linens are done washing and you hear the "BUZZ" to go ahead and go put them in the dryer. Do not put it off or it won't get done and then they'll sit in the washer and smell yucky in a few hours. Yep, I'm guilty of it too. I really didn't want to admit that :( Get yourself in the habit of doing this everyday no matter what. If you don't have a load to do, then you can scratch this off your list for the day. Do a load of dishes. Next, make your way around the house. Pick up any left over plates, glasses, snacks, boxes, bottles, diapers, whatever it may be and bring it to the kitchen. Whether you have a dishwasher or not, put all dirty dishes in the sink and throw away any waste around the house. If you have a dishwasher, load it full and hit start on that baby! If you don't have the luxury of having a dishwasher, go ahead and do a load of dishes and put them up to dry. Do this until all your dishes are done. Be sure after you do all of the dishes to wipe down your sink thoroughly. I use Windex Multi Surface and let it soak on the surface for about one minute then wipe clean with hot water. Get yourself in the habit of doing this everyday no matter what. If you don't have a load to do, then you can scratch this off your list for the day. Next, grab a trash bag. Go to every room that has a trash can and empty the trash into the garbage bag. If you use grocery store bags like we do in small trash cans, be sure to bring new ones to put into the cans. Finally, take out all garbage to your garbage cans. Remember this includes in your cabinets as well. If your husband leaves empty boxes of products or he keeps throwing those empty rolls of toilet paper behind the toilet like no one will notice. Yeah, we notice. Get yourself in the habit of doing this everyday no matter what. If you don't have a load to do, then you can scratch this off your list for the day. Do this at least once a week. Wipe down countertops & declutter the countertops. Wiping down your countertops everyday can really make a difference in how you feel about your kitchen. Remove any excess food or trash from the countertops and put all utensils and handheld appliances away in the proper places. Do this everyday. Wipe down all appliances & furniture. I literally do this about twice a week but this is totally up to you how frequently you do this. I start with my kitchen counters. Lift any pictures, canisters, cutting boards or utensil holders and wipe under them. Continue to wipe down the stove, refrigerator, dishwasher and any other appliance you may have. Head over to your dining room table and give it a good wipe down on the top and the seats. I find it more satisfying when I have a cleaner with a nice scent so it also "SMELLS" clean after you wipe it. During this time, I also make my way to the living room and wipe down the top of our t.v., our t.v. stand, coffee table & end tables. No complaining here! I have glass and I do it just about everyday :) Do this once a week. As simple as it is, sweep. Sweep any floor that can be swept except restrooms. That is covered under "taking care of each restroom." Do this every 3-4 days at least. If you are going to sweep, you should really mop right afterwards. Go ahead and get it over with. Don't let the kiddos or fur babies run in where you just mopped. Let it dry completely and enjoy a nice, clean floor. Do this once a week. Pretty self explanatory right? A freshly made bed can do wonders for a room. Fluff pillows. Everyday. That is make the bed everyday. Not wash linens everyday. Pretty self explanatory. Do this before you wipe baseboards & window ledges so no excess dirt will get on the ledges or baseboards. Do this every two-four weeks. Wipe down all baseboards & window ledges. So much dust and yucky stuff gets trapped on all baseboards and ledges. Wipe them down once every month. Remember to wipe down the top of your appliances, doors and stair railings as well. Do this every month. Take care of each restroom. Ensure all restrooms have at least 1 extra roll of toilet paper under the sink or near the toilet. I wouldn't want to be that house guest panicking because you forgot something! Bring your trusted cleaner (Mine is Windex Multisurface & Lysol in this case) and begin to wipe down the sink, toilet, shower including the shower head, knobs, etc & countertops. Put all hair & makeup essential away under the cabinet. Close the shower curtain and hang the towels up. Remember to wipe down the sinks, cabinet doors & countertops. Also, be sure to wipe down the doorknobs and doors in here! Be sure there are hand towels readily accessible for guests and plenty of towels under the cabinet for guests as well. This includes Sweeping & Moping each restroom. Sweep each restroom and ensure all dust and particles are gone by sweeping twice. Once going in the length of restroom. The second time by sweeping the width of the restroom. Mop here afterwards. Repeat this step for each restroom. Do this every week if possible...but it's at your discretion really. I am guilty of it too. Trying to find something to wear and throwing everything everywhere. Go in each bedroom and put all clothes away where they belong. Do this every week. Most of us have a "DROP ZONE" that we tend to throw junk, mail, keys, etc. Go through it all. Pay bills if need be. But get rid of it. TIP: Get a wall organizer with a key holder to put near where you come in everyday. Hang your keys up instead of throwing them down and put all new mail here. Do this every week. Go through each rooms clutter. Get rid of what you don't need! Period. Donate it to a shelter or store. You're helping someone else by doing so! This includes old clothes, shoes, old books, etc. Most people consider also having a yard sale for these items but a way to get them out faster is to just donate them and you're also helping someone else, remember?! Do this every month. This means clearing off all paperwork from the top of the desk. Go through it. Throw away what you need and file what you need to as well. Push in the chair & shut down the computer. Do this every week. can see from the front door. If there are clothes or items all over the floor, put them all in a pile and vacuum around them. Maybe this seems like a huge task but every time that I vacuum it instantly tricks me to believe that the room is cleaner. Even if the room isn't exactly how you want it to be, vacuum any ways. Here's the vacuum I use. It is a Shark Vacuum Professional Series. I LOVE it and have no complaints! It's cute because it's white too :) Do this every other night at least. Fluff the pillows on the couch, pick up any shoes or clothes hanging around where guests can see if they were to pop over, etc. Put all toys away. Vacuum if need be. I usually vacuum every night but I'm a little OCD. These are some things that I do everyday during the week to ensure that my house stays clean. It is never spotless although I do have people ask me is it ever dirty? The answer is yes. We do live here and we do function here. Food will get on the counter and floor. And the dogs will get hair everywhere. And kids will spill milk. Hope you enjoyed my tips on cleaning! I love Lysol wipes! I wipe down all three bathrooms everyday to keep them clean so I have a cannister in each bathroom. It takes no time! I also straighten the house every night so I can concentrate on cleaning during the day. I can't straighten and then clean because I'm exhausted after just straightening! It's also nice to wake up to a clean house. @ClassicStyleHome, I do too! Great minds think alike! Thanks for reading! Okay, promise...last comment today. I didn't realize you were an AF wife too! WE were AF for 10 years! Whoop! And you're Southern? I am from Bama! So cool! So glad to have found you! Thank you for the tips! I do struggle to keep my house clean. I, too, don’t do all the cleaning in one day; I just wipe off the dust and stains that are clearly visible on a daily basis. A daily routine of doing your bed, cleaning the dishes, throwing your garbage, and wiping on the surface is enough to keep your house presentable. Great web site. Lots of helpful info here. I'm sending it to a few pals ans also sharing in delicious. And certainly, thank you on your sweat! Please reply back as I'm hoping to create my very own site and would love to learn where you got this from or just what the theme is called. Appreciate it! It's genuinely very difficult in this full of activity life to listen news on TV, thus I simply use the web for that reason, and take the most up-to-date information. Thanks for sharing this, I love how detailed your schedule is, you managed to cover almost every part of the house! I spend a lot of time scrubbing the tiles around the house, it seems to be my biggest time waster when I start cleaning. Do you have a quick solution that will take off the grime off those? I use vinegar and baking soda sometimes for stubborn stains, but it's not good to use it on porous tiles. I personally prefer to use natural ingredients for cleaning, the store bought detergents often leave unpleasant chemical smells.